Praise and Five Star Reviews! "With The Gods of Second Chances, Dan Berne has created a world that is immediate and true, tender and tough as nails, with a protagonist, Ray Bancroft, to match. Ray’s struggle to stay afloat, to keep his family safe, is a harrowing one, full of ominous portents, dangerous adversaries, and hard-earned triumphs. Through it all, Berne navigates the treacherous waters of the human heart with a deft but unsparing touch. 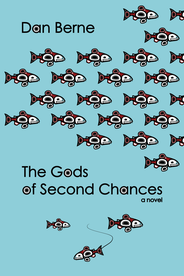 The Gods of Second Chances is a terrific debut from a talented writer." Set against a backdrop of ice and mud and loss, this debut novel explores the unpredictable fissures of memory, and how families can break apart, even in the midst of healing.